Donald (Babe) Richardson, 87, Lehigh, died Wednesday, January 30, 2019 at his home. Mass of Christian Burial will be held at 10:30 a.m. Wednesday, February 6, 2019 at Foster Funeral and Cremation Center in Webster City with Father Stephen Meyer officiating.Visitation will be held on Tuesday, February 5, 2019 from 4:30-7 p.m. at the funeral home, followed by a scripture service at 7 p.m. Burial will be in West Lawn Cemetery near Lehigh. Donald Emmett Richardson, son of Emmett and Rose Wingert Richardson was born March 22, 1931 in Lehigh. He lived in or near Lehigh all of his life. He graduated from Lehigh High School in 1950. Don married Norma Mueller from rural Burnside at Immaculate Conception Catholic Church in Lehigh on May 24, 1951. In 1956 the couple began farming when they moved to a farm east of Lehigh. Don also worked for 35 years at Lehigh Sewer Pipe and Tile, later called W.S. Dickey Clay Manufacturing Company. For 28 years he was the president of the union at the tile factory and for many years he also served on the board of directors for Lehigh Valley Credit Union. In 1987 Don began working at Land O’ Lakes Research Farm near Webster City and he worked there until he retired. In December 1991 the couple moved from their farm to Lehigh. Norma died in 2015 and Don continued to live at his home in Lehigh. 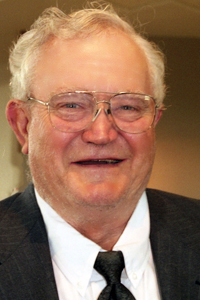 He remained actively involved in farm decisions until his death. Don is survived by children: Kathy and Larry Hough, Bradenton, Florida; Jim and Rose Richardson, Lehigh; and Phil and Kristi Richardson, Lehigh; six grandchildren and thirteen great-grandchildren and a sister Mona Maile, Lehigh. He was preceded in death by his wife Norma; parents Emmett and Rose Richardson and brother Bob Richardson. The family would like to thank Dr. Don Woodhouse and his staff for all the special medical care that was given to both Don and Norma. Also thanks to Dr. Mike Yanda and his staff for all the excellent veterinary care provided to their livestock and their beloved dogs Ernie and Sally.